On July 4, 2017, North Korea tested — for the first time — an Intercontinental Ballistic Missile, or ICBM, capable of hitting U.S. soil with a nuclear warhead. The test was hardly a secret. The North Korean regime announced the trial two weeks in advance. Western missile experts tried to raise public awareness of the coming test and its possible success. Ever cautious, the Pentagon has been hurriedly building a defensive “missile shield” composed of radars and missiles launchers in South Korea, Alaska and California. It did happen. Many previous North Korean missile tests — often involving smaller, medium-range rockets — dramatically failed, with rockets exploding shortly after launch or fizzling out mid-flight. But the Hwasong-14 ICBM apparently performed flawlessly. As North Korean dictator Kim Jong Un posed for video and photographs, the two-stage Hwasong-14 blasted off from a test site in North Korea and arced nearly 1,750 miles into space before re-entering the atmosphere and landing in the Sea of Japan some 600 miles from the launch site. By flattening the arc to a peak altitude of just 750 miles, a Hwasong-14 could, in theory, travel around 5,000 miles with a nuclear warhead. That’s far enough to strike U.S. territories in the Pacific, Hawaii and Alaska. North Korea tested its first atomic warhead in 2006. The impoverished and isolated country has been developing nuclear-capable rockets since the 1990s. Since assuming power from his late father in 2011, Kim has dramatically expanded North Korea’s missile program. Under Kin Jong Un, Pyongyang has tested scores of new missiles in just five years — three times as many as his father and grandfather had attempted. Many of those tests failed, including one in late April 2017. That clearly created an impression of systemic failure in the eyes of many observers, potentially including Trump. “We don’t estimate [North Korea] having a realistic capability to launch an ICBM at the United States until sometime around 2020 or thereafter,” John Schilling, a missile expert at the Aerospace Corporation, told Wired in April. But the frequent botched tests masked North Korea’s steady progress on certain key technologies that, combined, made July’s ICBM launch possible. “A lot of people have focused on those failures exclusively and ignored North Korea’s successes,” tweeted Shea Cotton, a research associate at the James Martin Center for Nonproliferation Studies in California. In March 2016, Pyongyang announced it had developed a heat shield for an ICBM re-entry vehicle. A year later in March 2017, the regime said it conducted trials of a new liquid-fuel rocket motor. In mid-June, North Korea claimed it had successfully tested an engine — possibly a version of that liquid-fuel motor — that could propel and ICBM. 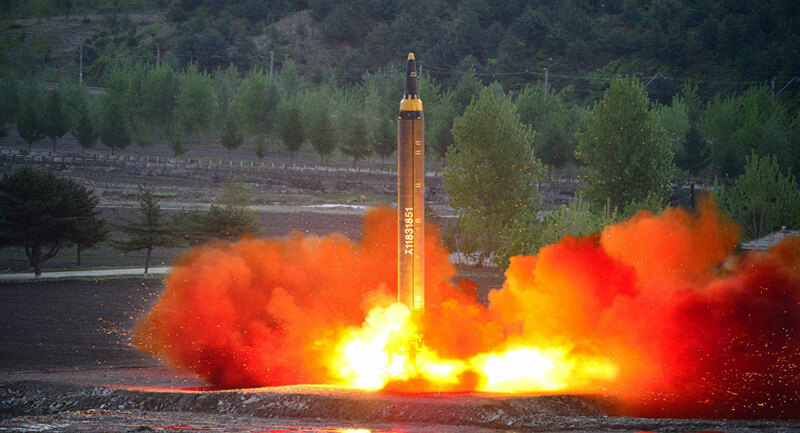 The Hwasong-14 test occurred just a few weeks later. As the small but significant successes piled up, Jeffrey Lewis, a nuclear-weapons expert at the James Martin Center, warned that North Korea’s ICBM might actually work. “They’re showing off all the associated technologies you need for credible deployments,” Lewis told The New York Times in April. His warnings mostly fell on deaf ears — and that, in part, contributed to the general sense of surprise and shock when North Korea finally pulled off its ICBM test. Was America caught off guard? “Given how hard it was to persuade other people this was coming, I’d say yes,” Lewis told War Is Boring. North Korean dictator Kim meanwhile is promising more tests — and, potentially, frontline deployments — of large numbers of longer-range rockets. “American bastards probably won’t like our Independence Day gift, but we’ll keep sending anyway to keep them busy!” Kim reportedly said following the July ICBM test. American leaders and officials best start paying close attention — and seeing the successes hidden in plain sight between the failures in North Korea’s expanding rocket program.